When people find out that I lived in China for three years, they usually exclaim and ask, “How was that? !” Typically, because there are no true words, I tell them it was amazing and chaotic. It’s difficult to describe three years worth of experiences that have very little in the way of comparison with the United States. The week after I graduated from college, I received a phone call from a friend living in Beijing, China asking if I wanted a job. She told me my apartment, visa and plane tickets would be covered, and the job was mine if I wanted it. I had never thought about China as an option for travel, let alone living. I had a desire to see the world and eight years of Spanish, but neither would really help me. Needless to say, I couldn’t say no, and six months later, I left. As far as teaching English in China goes, I think I got lucky. The company I worked for was owned in part by an American company, which meant that I had an American boss that headed the Division of Foreign Teachers. This was essential for all of those times that Chinese business made no sense to me. There truly is a paradigmatic difference in the way each culture renders its financial and diplomatic decisions. Just as a small example, each of the foreign teachers made about twice as much as the Chinese teachers that taught beside us, yet we worked half as many hours. I found that never speaking about this and making a real effort to show them how much I appreciated their work went a long way in making my days easier. They managed the parents, the other teachers in the schools, the discipline and the paperwork. I merely added to the pre-created lesson plans and showed up as an American face that made the parents sigh with relief that their children were receiving the best English instruction. I taught mostly first grade, aside from the adult tutoring I did in the evenings, and for most of the year, I guarantee I sounded like the teacher from Peanuts. However, somewhere around Christmas, you would see those little brown eyes light up and comprehension set in. Now, this didn’t always mean the students told me their favorite color or began reading the books we put in front of them. “Miss-uh H-uh! You have baby?” while being poked in the stomach. One of the first times I ever understood anything in Chinese was when this student looked at the Chinese teacher and said that all Americans are fat. An epitomizing experience—he spoke in English unprompted!! I understood Chinese!! He called me fat!! And there began something I constantly reminded myself of– I have been partially created by the place I grew up in, and no matter where I am, that can’t be changed. I can only hope that my influence opens the eyes of these children in the same way that my eyes are opened by teaching them. I’ll be honest. 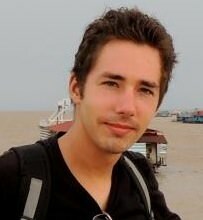 My time at work each day was the least stressful aspect of living in China. I had experience with kids previously, so when the ‘naughty’ student in the class started a revolution, marching around the class yelling ‘DEFEAT MISS H!’ in Chinese, I joined in. It was fun. Those children rarely had a chance to be creative and simply by being American, I was allowed to structure their learning experience how I saw fit. I also had 2 ½ months worth of vacation each year due to the Chinese New Year’s and summer vacations. I saved more money in China than I ever have in the States on a salary that was significantly lower. I traveled to some of the most beautiful places on earth. I often wonder why I came back. The people at that school became my family. We celebrated holidays together and they supported me through many difficult moments. They even took me to the hospital to get rabies shots when I woke up one night with a rat crawling across my neck. I wouldn’t have made it without them. If you decide to pack up and head out, choosing where you work is essential. Make phone calls. Write emails. Ask for the full package, because without those comforts, there will be very little offered while you are so very far away. And it is all so very worth it. 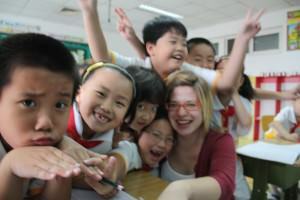 Katie has posted more pictures from her time in China on her photography Web site.